Indian emergency workers on Thursday said they have found the body of one of 15 miners trapped inside a so-called “rat hole” mine for over a month. 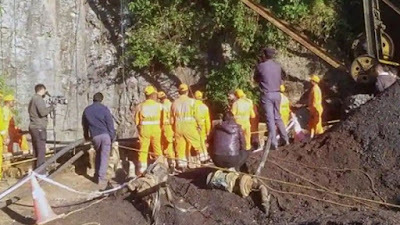 The illegal and dangerous mine in the remote, mineral-rich state of Meghalaya in India’s north-east was flooded on December 13. The Indian Navy said they spotted the body inside the deluged shaft at a depth of 160-210 feet (50-65 metres) with the help of a remote-controlled probe. “The body has been pulled up to the mouth of Rat-hole mine and shall be extracted out of the mine under the supervision of doctors,” the Indian Navy said in a tweet. The breakthrough comes after several attempts by navy divers to reach the trapped miners inside the treacherous mine. Efforts to pump out water have also failed. “Our operation is continuing,” S. K. Singh, in-charge of the national disaster relief force, told AFP. Indian authorities were criticised for being slow to respond to the emergency, including from the Supreme Court which called for rescue operations to be stepped up. Rat-hole mines are deep vertical shafts dug mostly into hillsides that branch out into narrow tunnels to reach and retrieve coal and other substances. A federal environment court banned wildcat mining in Meghalaya in 2014 after local communities complained it was polluting water sources and putting lives at risk. But the practice continues, with mine owners and the state government challenging the ban at India’s Supreme Court. At least 15 miners were killed after they were trapped in a flooded rat hole mine in Meghalaya in 2012. Their bodies were never recovered.